Sphero’s app-enabled interactive BB-8 toy seems to be the most talked about and highly sought-after piece of Force Friday merchandise, and for good reason: it’s an incredibly enticing and desirable piece of tech. That being said, for many of us it’s difficult to wrap our heads around spending $150 on a small toy (even in an admittedly super-cool way) when there’s so much other great Star Wars merch available right now that could be had for that sum. Luckily there’s an alternative interactive BB-8 for those of us who are hesitant to spend the necessary credits on Sphero’s version. The Disney Store, first in the UK and now here in the US as well, has released Thinkway Toys’ larger but less technologically impressive interactive BB-8 for only $35. My son was lucky enough to receive one as a birthday gift last week (which means I’m lucky enough to have one in the house), and while it isn’t the high-tech wonder that the Sphero version is, it’s arguably the better choice for kids and an undeniably endearing toy. When we opened the Thinkway BB-8, I was immediately struck by its size and weight; it’s a big and sturdy toy and it looks great from afar. We often leave her sitting next to our tv on the piece of furniture it rests on so that it’s both on display and ready to pull down and start patrolling the living room. On closer inspection there are buttons on the front and top of BB-8 that slightly detract from its authenticity, but for the most part it’s quite the toy and prop, especially for the price. BB-8 moves via a wheel underneath her body, which is initially disappointing, but it’s mostly hidden and it isn’t too noticeable until she begins cruising. Even then her wheel is essentially out of sight, but as soon as Thinkway’s BB-8 becomes mobile, it’s obvious that a toy like this one was never going to feature the incredible movement of its film counterpart. Still, though her lower sphere is stationary as she rolls around, her head does swivel from side-to-side and she has a blue eye that lights up as well. Movement is activated either by button (on top of her head) or apparently sound, though I’m not quite sure how that works. Unfortunately the instructions are limited to images and light text on the packaging, so I’m still not clear on how the voice activated mode really works. But whether activated by button or by sound, Thinkway’s BB-8 will roll around for a few feet or until she bumps into something insurmountable for her wheel to climb over (she’s pretty good at making the jump from my hardwood floor to an area rug though). Though the sounds she makes are a nice touch (especially her super-cute shutdown beep), her motor and wheel are also louder than I expected and result in a fairly distracting amount of noise. And though she’s sturdy and seems like she’ll hold up even with a lot of play, her antennas are her one structural weak point. One of them broke within a day of use (she often bumps into walls and other objects), so I’d recommend keeping those packed away or closely monitoring her movements to keep her pristine. I’m enjoying our BB-8 quite a bit; it’s a fun toy and it looks great when not in use. That being said, it isn’t a collector’s item designed for adults looking for a cool gadget or impressive technology like Sphero’s BB-8. While I’m hoping to get one of those as well, I’m happy to have an affordable alternative in the Disney Store/Thinkway BB-8 and I think it’s an excellent choice for families or for anyone who wants an interactive version of the new droid but can’t afford the pricier version. The Thinkway BB-8 is on shelves at Disney Stores now, but it’s also available on their site. I’ve noticed that the listing has been pulled from the site at least once since the toy was released, so if you’re interested keep checking back in the event it’s not currently available. 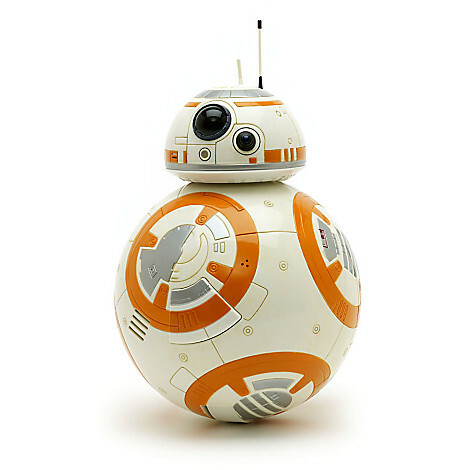 Categories: Products | Tags: BB-8, Disney Store, Products, The Force Awakens, Thinkway, Toys | Permalink.